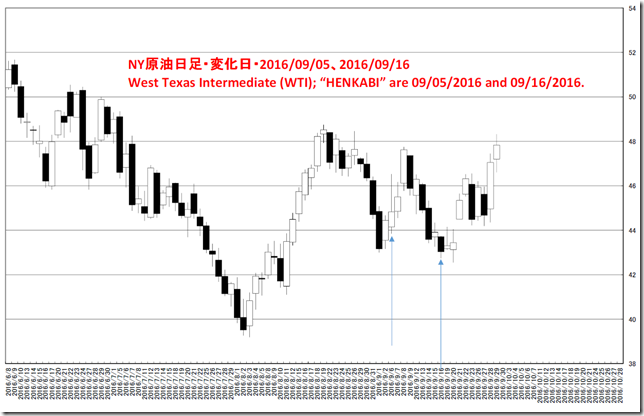 West Texas Intermediate (WTI); May launch? “HENKABI” are 10/12-13/2016 and 10/26/2016. 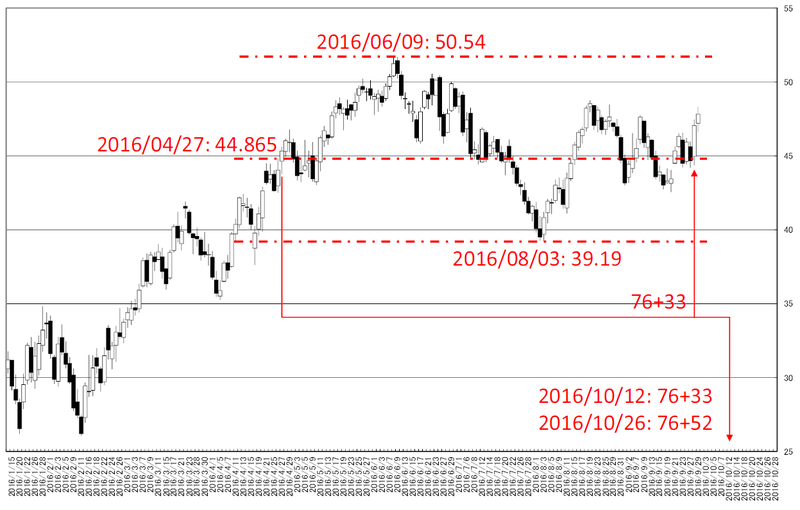 In latest chart, this market has already launched but may be steadiness because of “HIGARA” appearance. 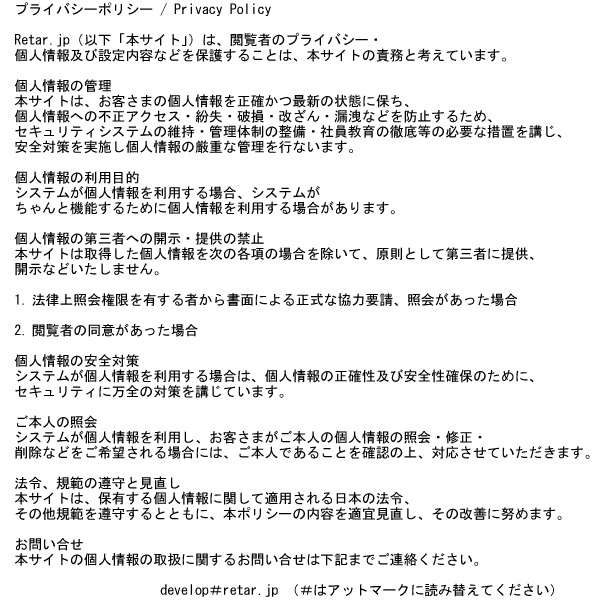 We review our past “HIGARA” report in any time. 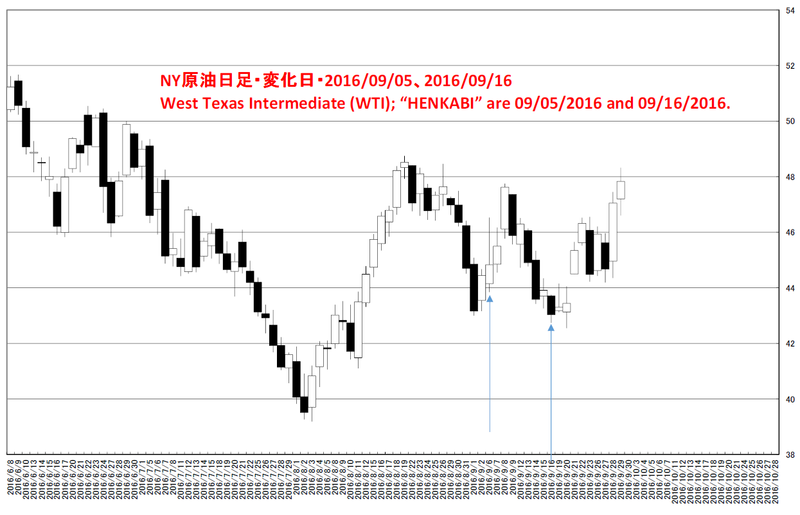 In 08/24/2016, we reported “West Texas Intermediate (WTI); “HENKABI” are 09/05/2016 and 09/16/2016”. We focused on almost major bottom. This is the “HENKABI” from the major peaks. 09/30/2016, 10/19/2016 and 11/01/2016 will become “HENKABI”. This is the “HENKABI” point from 04/27/2016 steadiness starting. 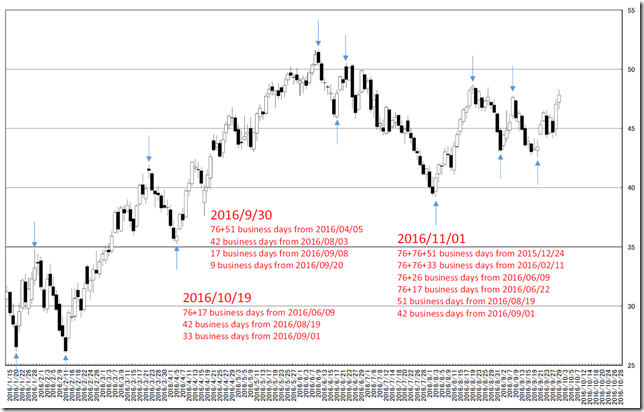 76+33 business day is 10/12/2016 and 76+52 business day is 10/26/2016. 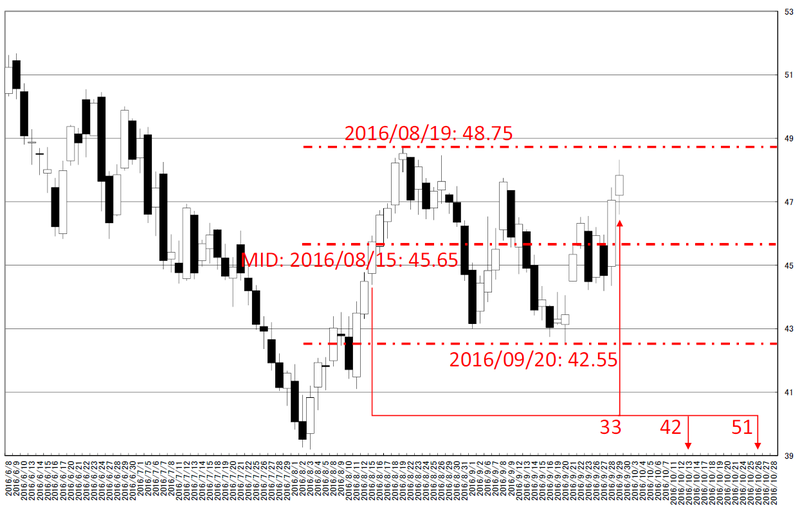 The market price launched in “HENKABI” and this often suggests start of trend. 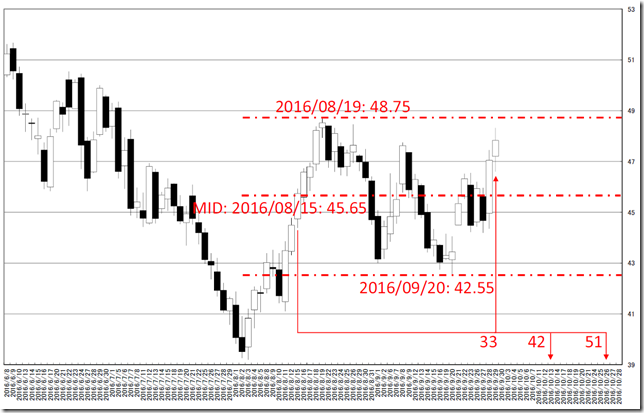 This is the “HENKABI” point from 08/15/2016 steadiness starting. 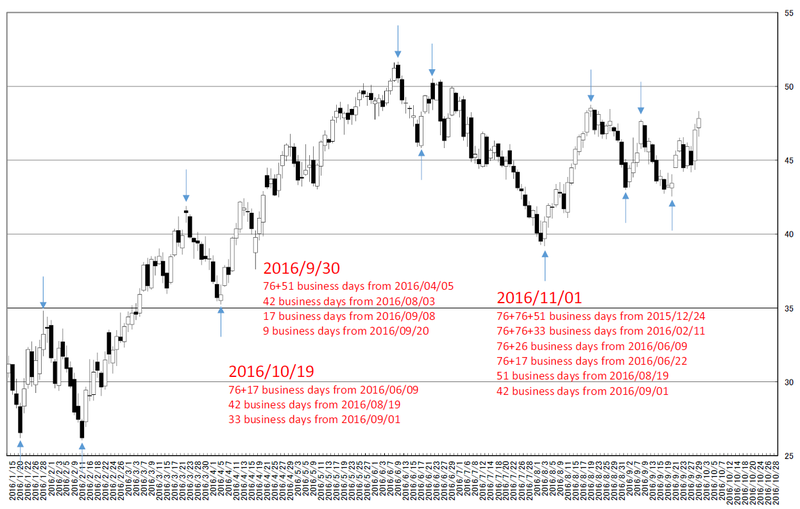 42 business day is 10/13/2016 and 51 business day is 10/26/2016. 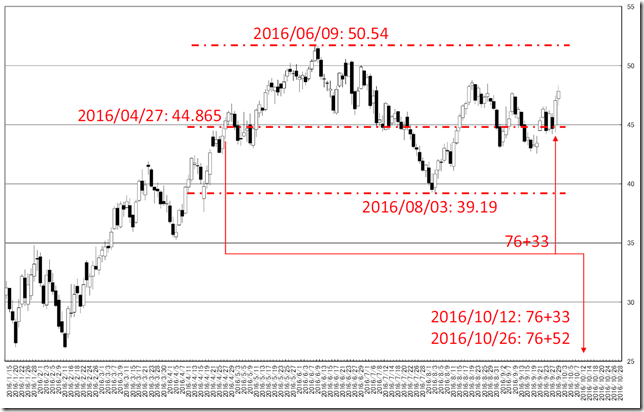 The market price launched before “HENKABI” and this often suggests start of trend. 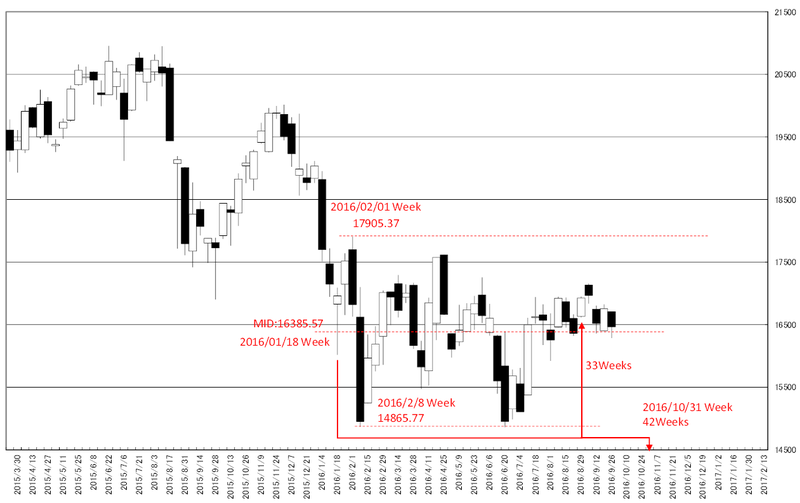 NIKKEI 225 weekly; “HENKABI”; 16385.57yen will be support. Today is about N225 weekly. Our conclusion is 16385.57yen will be the support for some time. But now may have already start bearish market. 65 weeks from 08/10/2015 week and 9 weeks from 09/05/2016 week is 10/31/2016 week. And 76 weeks from 06/22/2015 week is 11/28/2016 week. These points may be reversal week. This is the “HENKABI” point from 09/07/2015 steadiness starting. The half price is 17439.085yen and now is far from it and “HENKABI” is also far future. The market price may have already failed to challenge the mid-price. This is the “HENKABI” point from 01/18/2016 steadiness starting. The market price appeared lower shadow and this occasion seems to be “lower support will be hard”. But the market price did not launched at 33 weeks to upside and may fall.